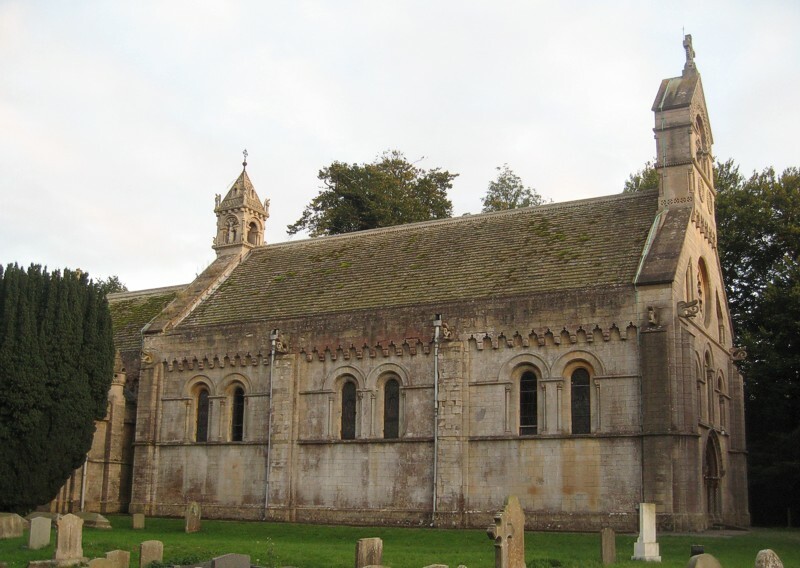 St Helen’s Church in Thorney was built of stone in 1849-50 by L N Cottingham, who was said to be ‘better known for his writing than his buildings. Sumptuous ham-fisted Norman exterior, with west façade and bellcote’ (Pevsner). It consists of a nave, chancel, vestry, and west turret with two hemispherical bells. There is much fine carving inside and out, such as the west doorway, the details of the frieze, the great dragons’ heads in the four corners and the highly ornamental casket-like turret. All the windows contain stained glass. There is a piscina, sedilia, pulpit and lectern in stone and a large Victorian font. In the chancel are monuments for Farington Nevile (d1760), George Nevile, (d1742) and his wife, and Richard Rothwell, (d1727). Throsby described the original church in 1797 as having ‘a low brick tower with two bells, a nave and side aisle’. Two 15th century arcades from that building were re-erected in the churchyard. To counter Pevsner’s opinion Henry Thorold in The Shell Guide to Nottinghamshire declared the church to be ‘as magnificent as it was unexpected’.